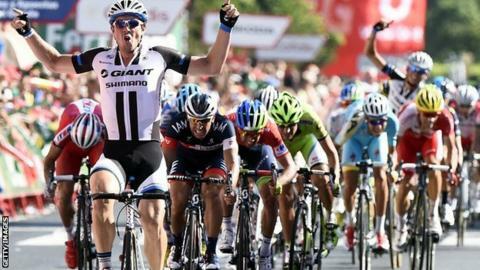 Australian rider Michael Matthews remains the overall leader of the Vuelta a Espana after Germany's John Degenkolb won the fourth stage. Matthews, 23, took the overall lead on Monday after winning the third stage. Race favourite Nairo Quintana is eight seconds back, while Britain's Chris Froome trails by 35 seconds. IAM's Reynes made a break for the line, but Degenkolb covered his move before powering clear of the peloton to win by a couple of bike lengths. 1. John Degenkolb (Ger/Giant) 4:02:55"
1. Michael Matthews (Aus/Orica) 13:30:44"
2. Nairo Quintana (Col/Movistar) +8"
3. Alejandro Valverde (Spa/Movistar) +15"
4. Rigoberto Uran (Col/Omega Pharma - Quick-Step) +19"
5. Damiano Caruso (Ita/Cannondale) +21"
7. George Bennett (NZ/Cannondale) +24"
9. Alberto Contador (Spa/Tinkoff - Saxo) +27"
15. Chris Froome (GB/Team Sky) +35"